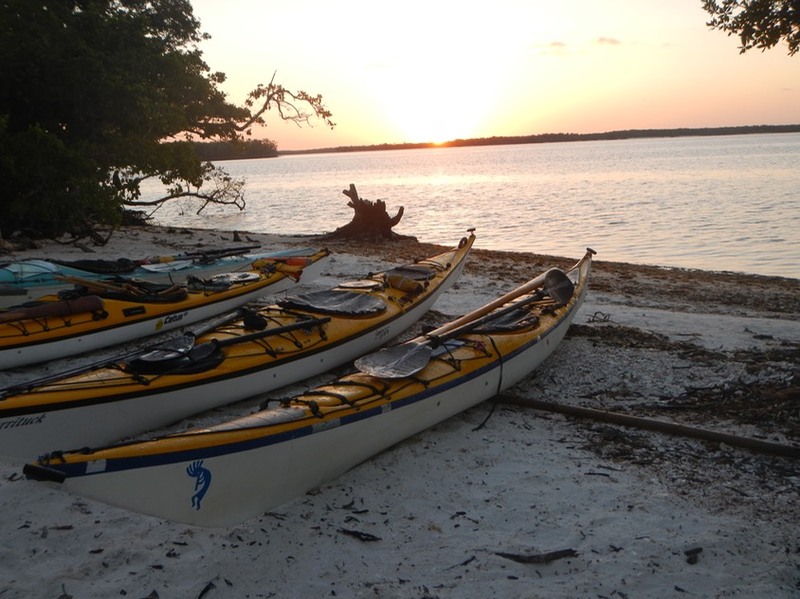 February 17, 2013 - Everglades City: It had been six years since I last paddled Florida’s Ten Thousand Islands. Then I had paddled with outfitter Scott Locorini of Adirondack Exposure and my friend John Resch. This time I would be paddling with long time paddling buddies Bruce Romanchak, Alan Lovegren and Mark Mykytyn. 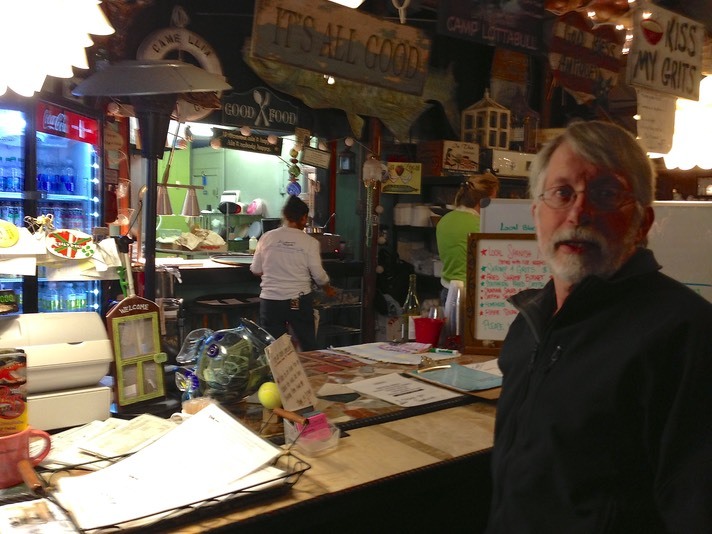 I met up with Bruce and Alan in Everglades City on February 17th. 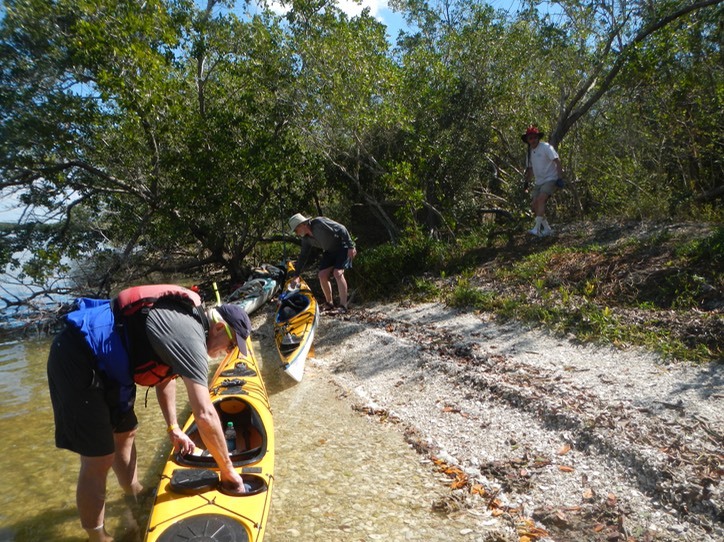 After a quick lunch we headed over to the west coast ranger station of Everglades National Park to gather information and plan a day paddle for the afternoon. 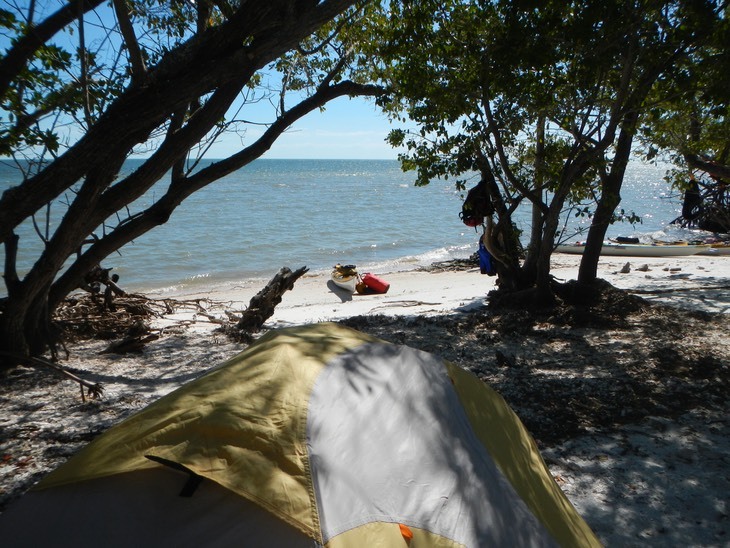 My original plan had been to put in at Collier Seminole State Park, north of Everglades City, and paddle through the state owned islands, spending each night on a different island. After some discussion, it became apparent that there were some advantages to launching from the National Park. We could avoid a need to shuttle cars and boats between sites and also have free parking by launching there. 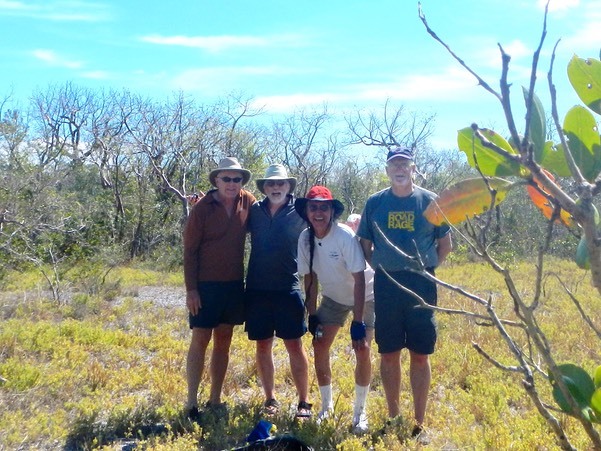 And, because the group preferred to do base camp camping rather than move every day, we could go to a favorite island, LuLu Key, set up camp and do day trips from there. But that would happen tomorrow. 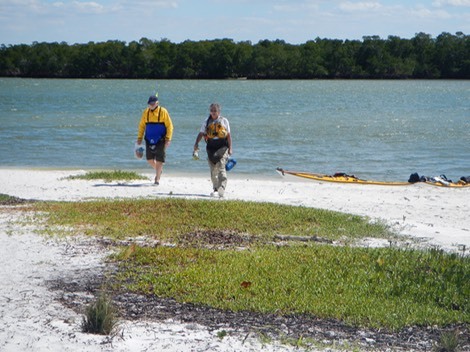 This afternoon, Bruce, Alan and I would paddle to Sandfly Key. Mark would join us tomorrow. 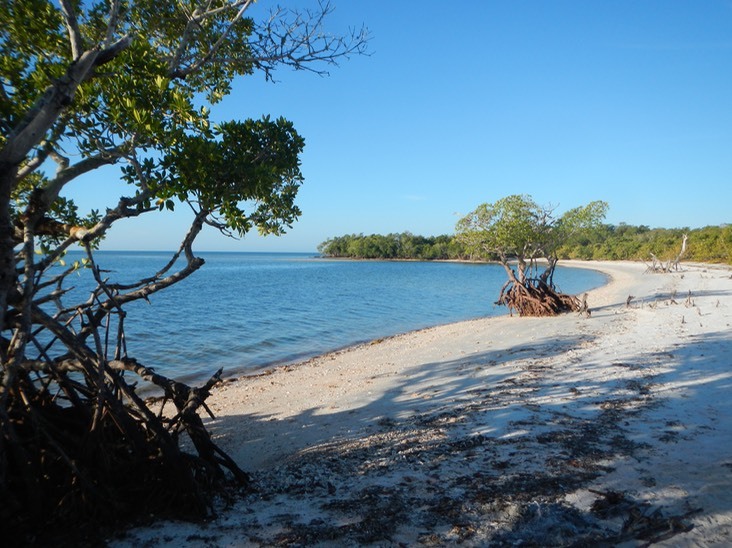 Sandfly is a shell mound island, created from the shell refuse of the Calusa Indians who lived in the area for thousands of years. 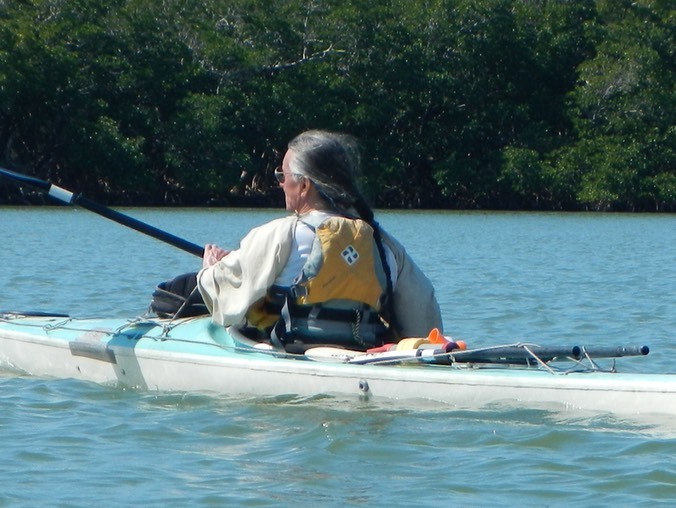 (see Calusa, the Shell Indians at http://fcit.usf.edu/florida/lessons/calusa/calusa1.htm ). It is amazing to think that islands the size of Sandfly could be built up from what is essentially the garbage of an ancient people. I had been to Sandfly seven years before. It was much as I remembered it, right down to the big blue porta-pottie sitting high above the water on a walk-up platform above the docking area. 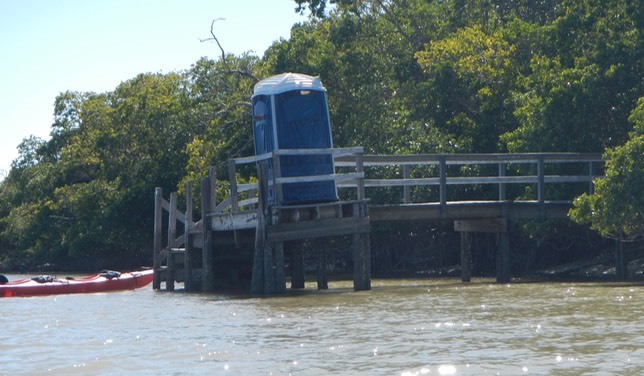 The porta-pottie was tipped at a precarious angle on the slanting platform, the victim of a passing storm or hurricane. Our paddle out was generally uneventful. It was great to be back on the water again with good friends. We did have to pick our way around and through some shallows full of boat damaging oyster shells to get there, but that is all part of the adventure. Once on the island we found the National Park Service created trail that circles it. The trail makes a loop heading through the island’s center, then skirting the outside edge, mostly staying within the trees. We saw a lot of one peculiar tree, the Gumbo Limbo Tree, also known as the “Tourist Tree”. 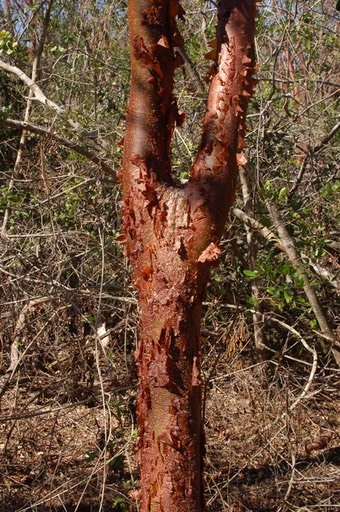 This tree has layers of thin red bark that peel back in the same way that the sunburned skin of visiting tourists does after too much Florida sun. Dinner this night was at the Camillia Street Grill, a campy laid-back place with great seating on the water. Dinner is ordered cafeteria style on the honor system and brought to your table when ready. It’s a fun place to eat and I recommend it. We stayed at the Everglades City Motel which I had booked sight unseen. It was clean and fresh and the rates were reasonable. The owners were cheerful and accommodating and our room had a back door leading to an area where we could safely leave our cars and boats. I kept no data on miles or speeds of this leg of the trip. 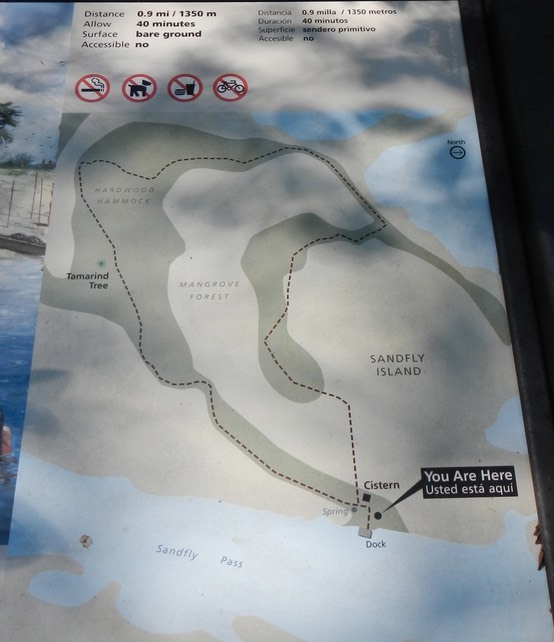 The round trip from the Ranger Station to Sandfly Key and back was about seven miles. We paddled against wind and tide on our return, but it was not difficult. ENP Ranger Station, upper right. Lulu Key Lower Left. Lower route taken. We were up early to have our last shower and shave for several days. Then it was off to Chokoloskee Island and the Havana Cafe for breakfast. After breakfast we met Mark at the ENP Ranger Station boat ramp. It took a while to pack our gear as we were heading out for four days on a self contained, unsupported trip. There was another large outfitters group gearing up at the same time. They were headed for campsites in the national park. The Ten Thousand Islands lie in the Gulf of Mexico. Some of the islands are within the national park, while others are state owned. We planned to camp on the state owned Lulu Key. The reasons were simple; fewer people and fewer regulations. 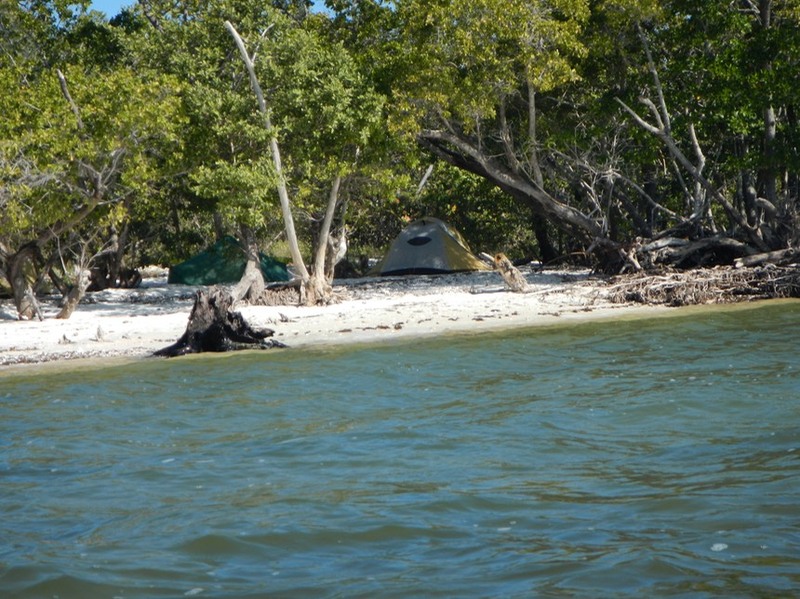 You must register for available NP island campsites. You may only camp on the site you register for and only for as long as your registration allows. The state islands are wide open. You can camp anywhere on any of the islands for as long as you want and move when you want, as long as you practice “leave no trace” camping. There is no fresh water available on any of these islands, state or national park. Therefore we needed to carry all of the fresh water we would need for the four days of our trip. The minimum recommended amount is one gallon of water per person per day. So, we were packing and carrying sixteen gallons of water in our boats as we headed out that morning. Fresh water is the limiting factor in the islands and may be one reason why the state can be so casual about its approach to camping there. People can’t stay too long before needing to resupply water. We got on the water rather late, sometime after eleven o’clock. We were in no particular hurry as we had less than nine miles to paddle. The most direct route is down Indian Key Pass, following the navigation channel. Then west along the outside of the islands to Lulu Key. Instead, we took the Indian Key Pass as far as Indian Key Shore, then took the narrow channel between mangrove islands into Gaskin Bay. Much more interesting and no power boat traffic. 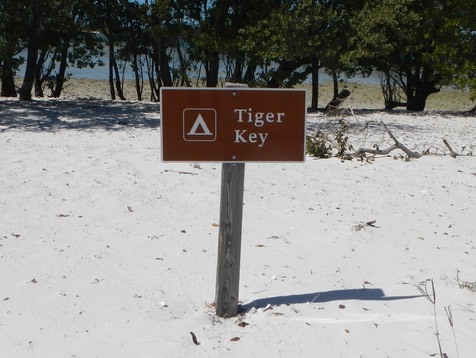 We rounded Picnic Key and made a lunch stop at Tiger Key. (Both Picnic and Tiger Keys are NP islands) From Tiger you can see Lulu Key, a mile or so away. 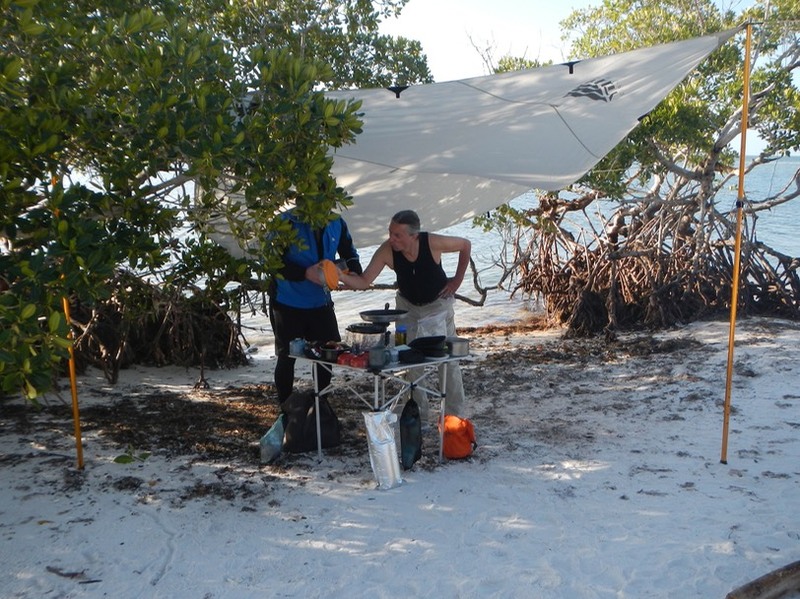 We arrived at Lulu Key around 2:00 pm and scouted the beach for a suitable campsite from the water. Mark had been to Lulu Key many times. It was one of his favorite places. So we let him take the lead on campsite selection. Ashore, we set about establishing our campsite, locating a place for our “kitchen” near the water and somewhat removed from our sleeping area. Tents were pitched and gear stowed. Soon we were thinking about dinner. I have a camp table that rolls up into a bag (6 by 30 inches) that I carry on my back deck. This was set up in our “kitchen” area. Next I got out my clear collapsable plastic bucket and filled it with sea water. This was tied to the table and served two purposes: it held the table down when the wind came up and, after the particulates settled out of the water and chlorine was added to the mix, we were able to use the sea water for washing and rinsing our dishes. A tarp was slung over all of this as a defense against heavy winds, rain and the occasional heavy dew. Dinner was Pad Thi with rice noodles, chicken and crushed peanuts. Dessert was chocolate. Mark joined us in this meal. He is glucose intolerant but because I was using rice noodles in this recipe he could enjoy it. It was fairly windy, so the No-seeums were only a minor annoyance. We cleaned up dinner and had a campfire before turning in for a warm and pleasant night. Moving Time: 2 hr. 33 min. Our route. A slip of the pen had us paddling over dry land. Didn't happen. We awoke to a bright and sunny morning; a perfect south Florida day. There had been a heavy dew during the night. The outside of the tent was as wet as it would be after a rain. But inside everything was snug and dry. I’m always wakeful at night when camping. It’s not that I’m a light sleeper. At times I swear that a raccoon could chew into my tent and make off with half of my worldly goods and I wouldn’t wake up. But it seems that I awaken periodically, take stock of my surroundings and go right back to sleep. This may be because of sleeping in unfamiliar surroundings or it might be because we are in our tents for ten or more hours. What ever the reason, during several of these wakeful periods I became aware of Alan tossing and turning on a very noisy air mattress. It reminded me of the twenty year old hand-me-down mattress I had as a kid. Alan’s tent was just behind mine on a slight incline that he had tried to correct by pushing sand under one side. This was Alan’s new one-person tent. It barely had room for his mattress and sleeping bag, and Alan is a big man. This combination of things was making him very uncomfortable: thus the rolling around. I think things improved for him somewhat over the next few nights. We decided on a real breakfast this morning - bacon and eggs. Mark, who has short order cook on his resume, was our chef. After breakfast and cleanup, we got into our boats for the day’s adventure. We would tour all the islands we might have stayed at if we had gone with my original plan of moving camp every day. Our route took us from Lulu past Round Key, then on to Panther, passing through a cut in the island and around some shallows on our way to Hog Key. Hog Key had been my favorite camping spot on my last trip here. But this time Hog looked like it had been badly damaged by storms. The beach was littered with downed trees and debris. I really didn’t recognize it. 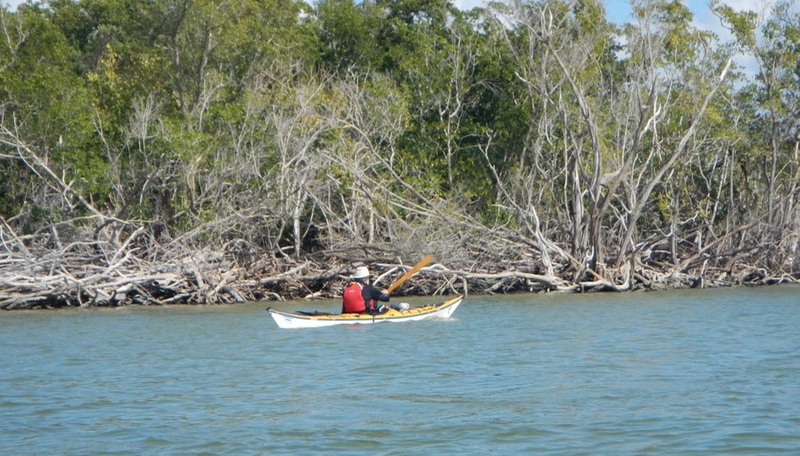 Looping around the south side of Hog Key, we headed for White Horse Key and paddled along the northern shore before completing a circumnavigation of the island. 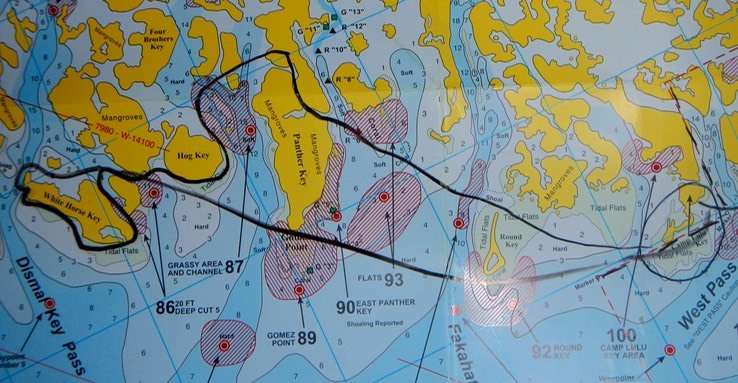 Our route home was more direct, a straight line passing the southern tip of Panther and Round Keys before landing back at Lulu around 3:00 pm. The paddle was wonderful. We poked along enjoying the scenery as we passed among and even through the many islands on our path. Temperatures were in the mid-seventies, with light winds, just enough to cool us. We had sun and blue skies, with Florida’s wonderful puffy white clouds spread across - It was, as we Floridian’s like to say, “Just another day in paradise!”. Dinner was three cheese tortellini with bacon bits and sun dried tomatoes in a balsamic vinaigrette dressing. And of course, chocolate for dessert. Moving Time: 4 hr. 15 min. Finally, Fakahatchee Key! I had paddled by this shell mound island on my first trip here but hadn’t been able to land. This time we would land and explore. 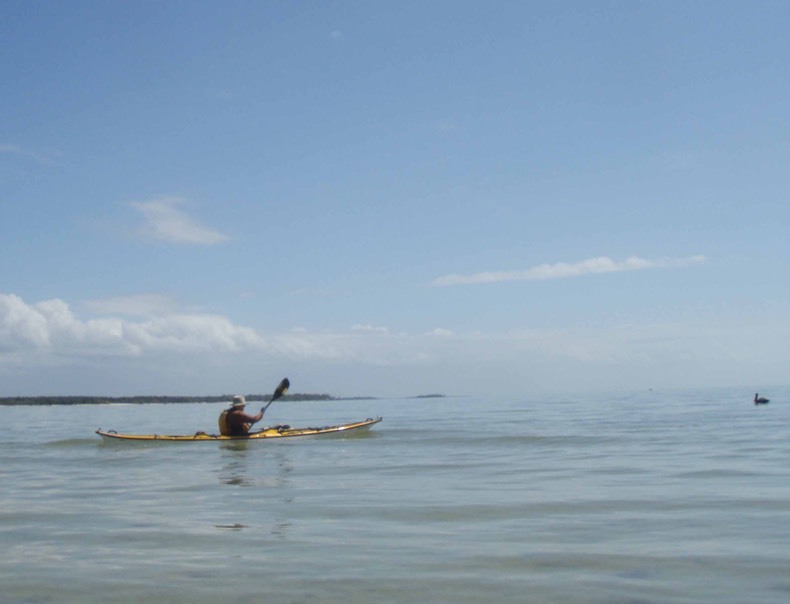 We had beautiful weather for our paddle to the island; blue skies, white puffy clouds, warm temperatures and light winds. 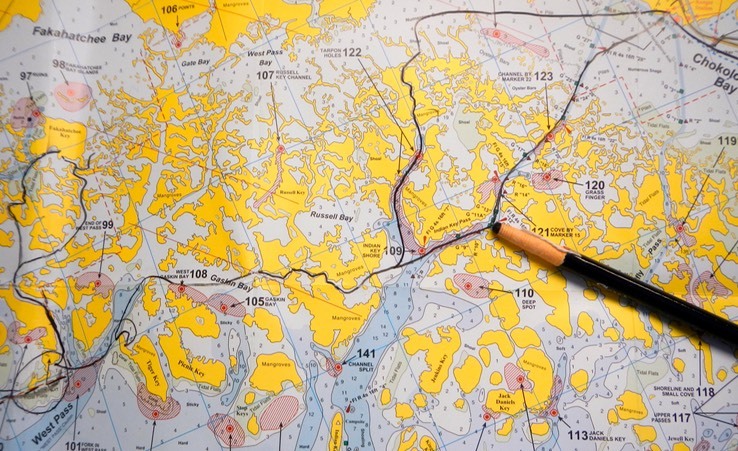 Our route took us through broad, then narrow passages between and through unnamed mangrove islands (see map). It was fun finding our way through some of the narrower passages. Mark had paddled here before and thought he knew the way. He did in a general sense. But the mangrove islands aren’t static. They grow and change. Storms can rearrange their shapes, while the red mangroves march ever outward on their leg like roots. Many of these mangrove islands aren’t islands at all. They contain no solid ground above sea level. When a storm comes its waves will just pass through, the mangroves absorbing the storm’s wave energy. That is how they protect Florida’s coast and is why they are protected in the state. Fakahatchee is different. 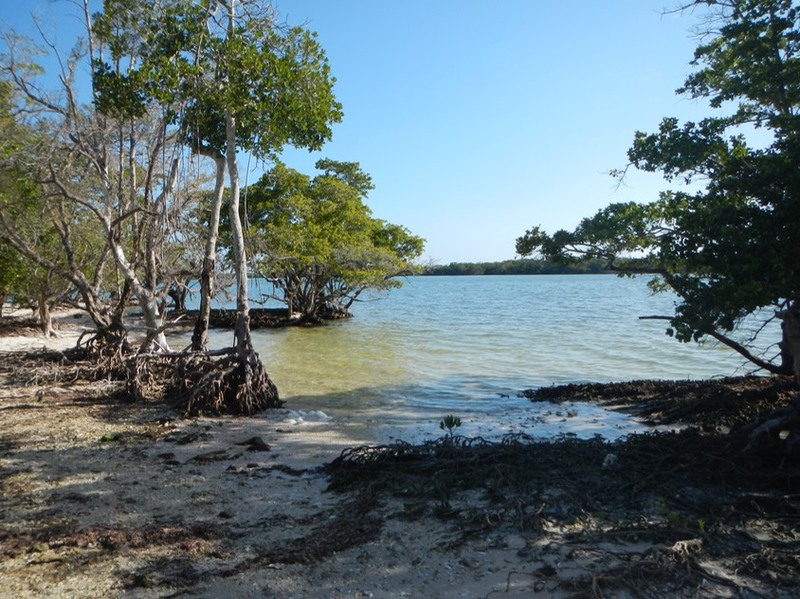 It is a man made island, crafted by the Calusa Indians over hundreds of years from the shell refuse discarded as they prepared their daily meals of shellfish. It is hard to imagine how this could be done. But there are many of these shell mound islands in this area (Sandfly Key is a shell mound island). I could see shells from ancient meals stacked at least four feet deep in a cross section where part of the island had washed away, with soil and trees growing on top. Mark took us to a landing site he knew of, but we elected to pass it up while we explored more of the island’s perimeter. This is not an island of pristine white sand beaches. There are very few easy landings. We eventually found a narrow landing spot, the area we elected not to use on the previous trip. We got out of the boats one at a time and carried each boat up a short incline to a flat relatively open space. Mark set about removing his sun protection paraphernalia. This was something to watch. He has a unique way of protecting his arms from the sun. When the sun gets too intense for his short sleeved shirt, he pulls the zip off legs of an old pair of pants over his arms, connected with a short bungee behind his back. It’s unconventional and looks a funny, but it works. And Mark is nothing if not unconventional. It was lunch time, so we all had something to eat and drink. It was hot on the island. No breeze penetrated the dense growth that surrounded us. Bruce is the explorer in our group. He found a trail and, after we had eaten, led us into the unknown. 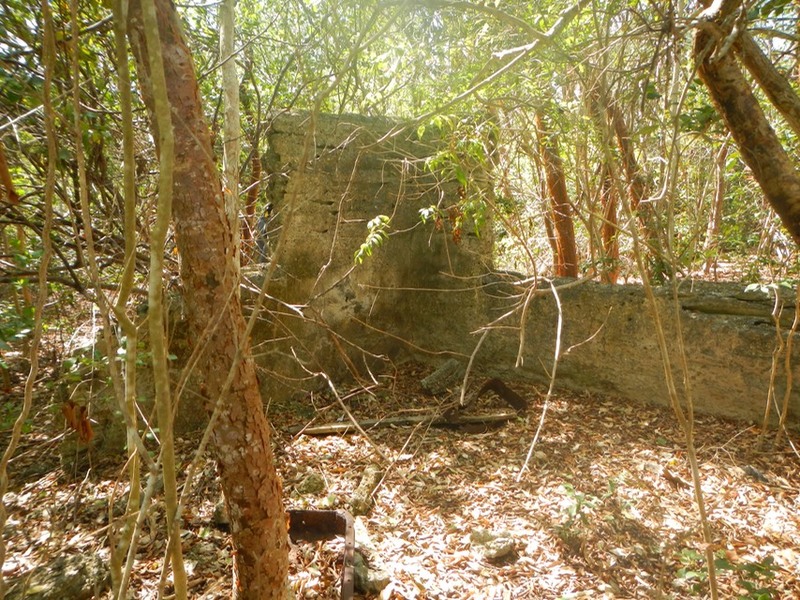 We new that there were the remnants of an old house, a cistern, and a family graveyard. Who knew what else we might find? Bruce thought the trail would take us around the island, but it did not. So we eventually had to backtrack to our boats. Still, we did find the island junkyard and the family graveyard. 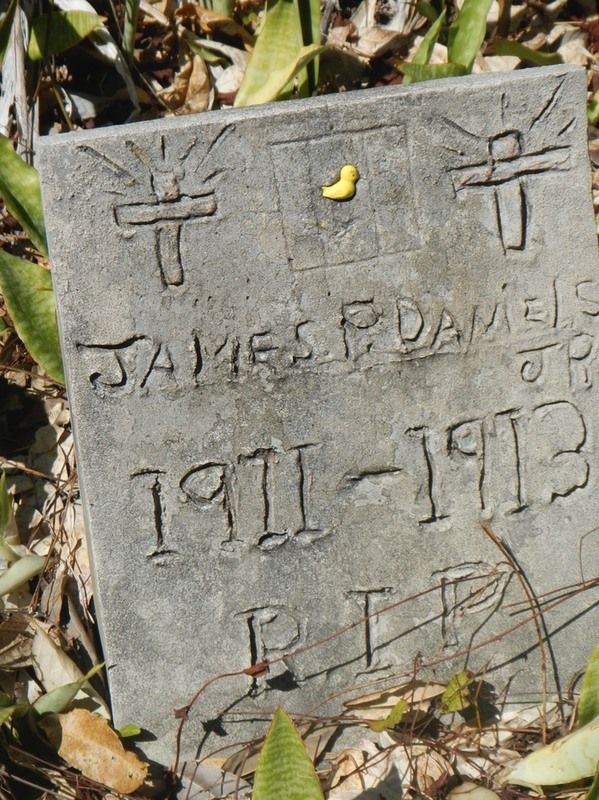 The last gravestone was that of a child, James P. Daniels Jr. born 1971, died 1973. Who were these people and when did they live here? The best I could discover was that they were poor farmers who tried to scratch out a living growing tomatoes for the local markets. They were driven off the island in the late 1970’s by a hurricane and never returned. We launched our boats and headed back to Mark’s original landing. It was difficult because the shore was steep in this area. But we managed to get all the boats ashore and headed off on another explore. Right in our landing area was the remains of the settlers cistern. There is no potable water available on any of these shell islands. So, all water was either gathered from rainwater runoff and stored in cisterns, or brought from the mainland. Further back and hidden from view was the ruins of the settler’s house. The construction was really unique. 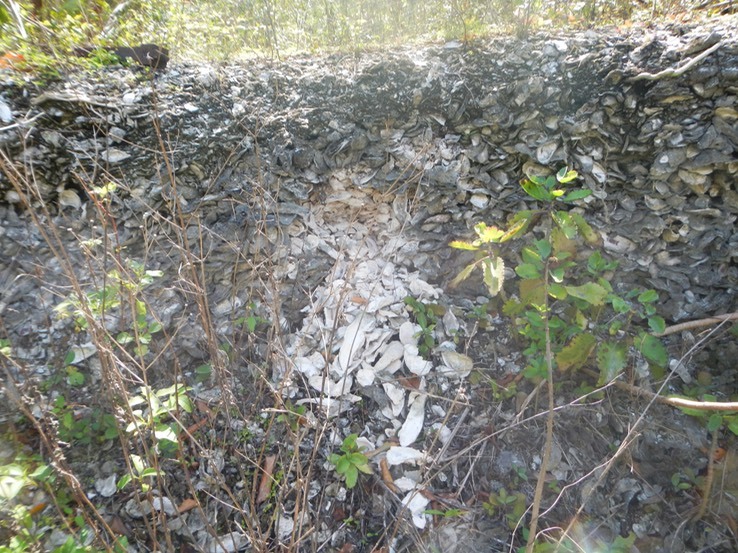 The walls were of the “Tabby” cement used by early settlers (Tabby cement uses oyster shells as the source of lime in creating the cement mixture). What made these Tabby walls different was that they had openings inside the walls, running parallel to the ground, almost like the openings in modern cement blocks which run perpendicular to the ground. There was no clue as to how these openings were made. It was an intriguing puzzle. Soon Bruce was off down what passed as a trail. It was marked with strips of t-shirt and an occasional empty beer bottle stuck on the broken end of a head high branch. 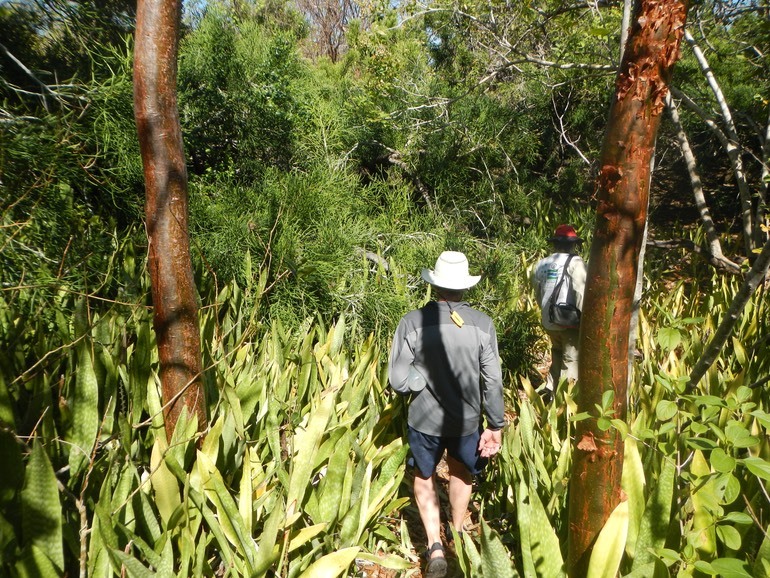 As the trail went on through scrubby but dense growth, we speculated about who could have blazed and marked this trail. Our favorite scenario was of a lovely damsel forced to tear ribbons of cloth off the bottom of her t-shirt in order to mark her way back. And it was a long trail. In reality, the trail was probably blazed by a few drunken red necks who came ashore from their noisy air boat to party. The center of Fakahatchee Island. That little figure in the distant center of the picture is Bruce. The trail led off toward the center of the island. Bruce hoped that it would bisect the island and get us to the other side, but, no such luck. The trail ended in a desolate, flat, open area. It was hot and the ground was littered at the surface with shells. Nothing of any size grew there. We looked for a continuation of the trail around the perimeter of this space, but found nothing. The earlier explorers must have run out of t-shirt, or beer, or ambition, and stopped in this place. We milled around for a while, then posed for a group shot to commemorate the trip before following the t-shirt and beer bottle trail back to our boats. We took a slightly different route back to Lulu Key (again, see map), arriving there abound 3:30 pm. Fakahatchee was a great explore and arguably my favorite paddle of the trip. Dinner tonight was Burrito Supreme. 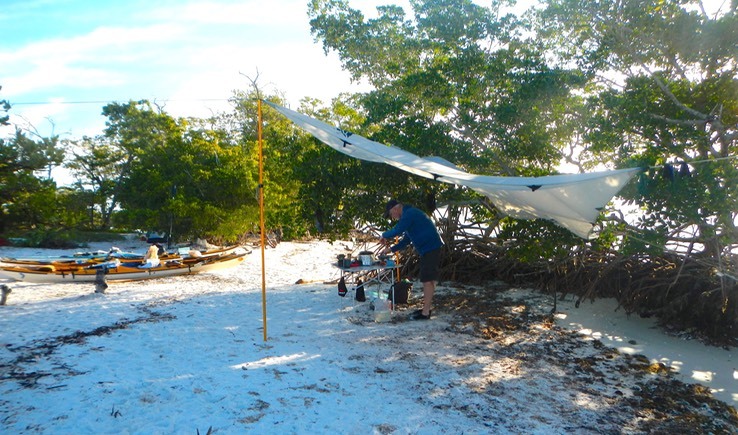 Then a campfire and to bed as we looked forward, with some regret, to our last day of paddling and the return to Everglades City. Moving Time: 2 hr. 49 min. 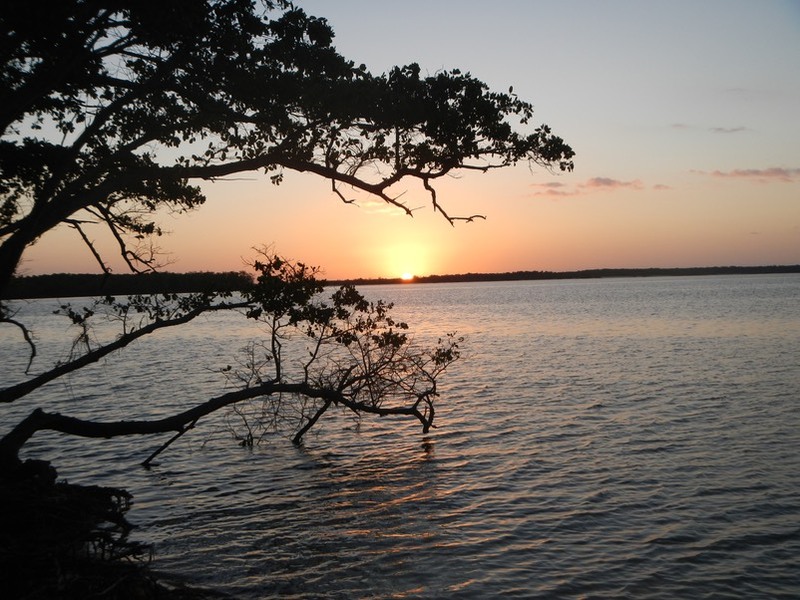 Today we leave Lulu Key and return to Everglades City. 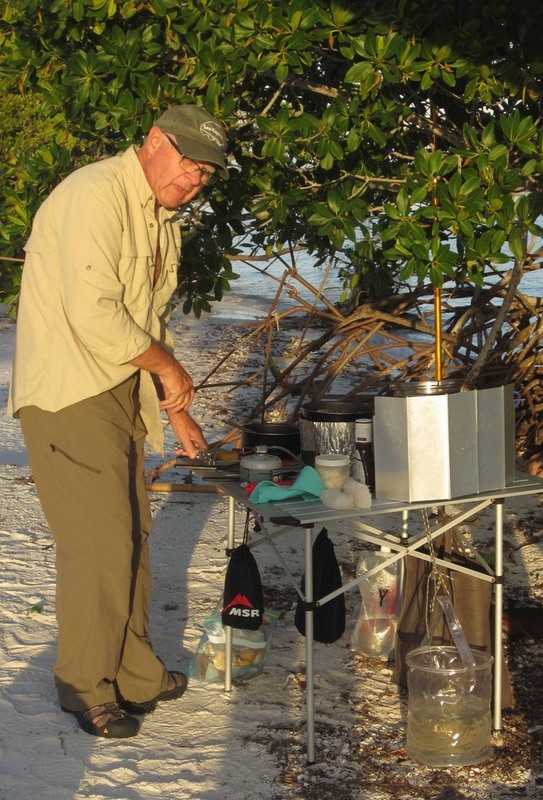 Mark will return to Collier Seminole State Park this evening and Bruce will leave for home tomorrow morning. Alan and I will hang on for one more day of paddling. Knowing this made breakfast a bit subdued. We finished our supply of bacon and eggs and quietly cleaned up. Cooking gear was packed along with the table and rainfly. Then sleeping gear and tents were packed. Finally we loaded everything back into the boats and bid farewell to Lulu Key at 10:45 am. 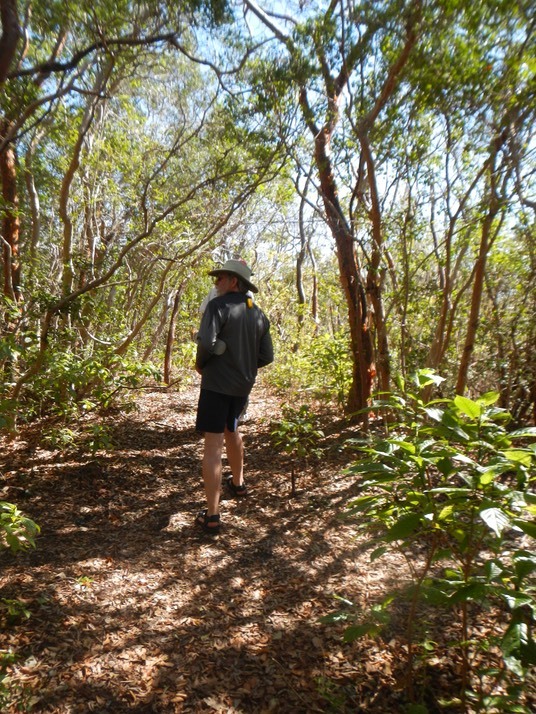 We followed a slightly different route on our return to the Everglades National Park Ranger Station. 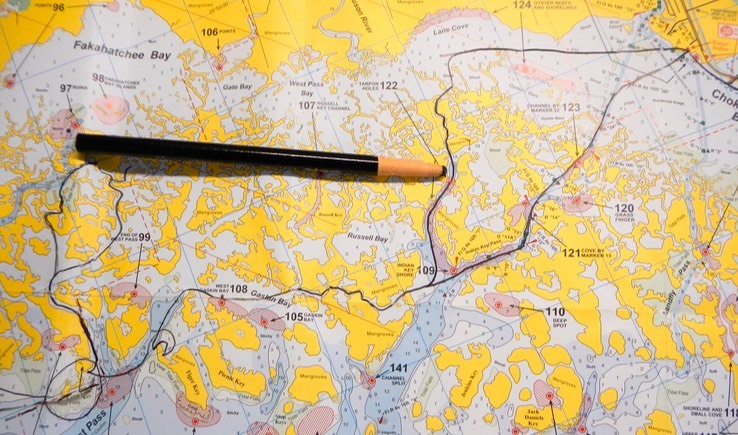 We picked our way through a maze of unnamed mangrove islands, avoiding deeper, less restricted water where we might encounter power boat traffic. The day was beautiful: sunny and warm with light winds. We took our time, enjoying our last few hours in this beautiful spot, paddling with friends with whom I’d shared many paddling adventures over the years. None of us are getting any younger and I sometimes wonder how many more adventures we have left in us. But I know I’ll keep on paddling as long as the body and spirit allow. 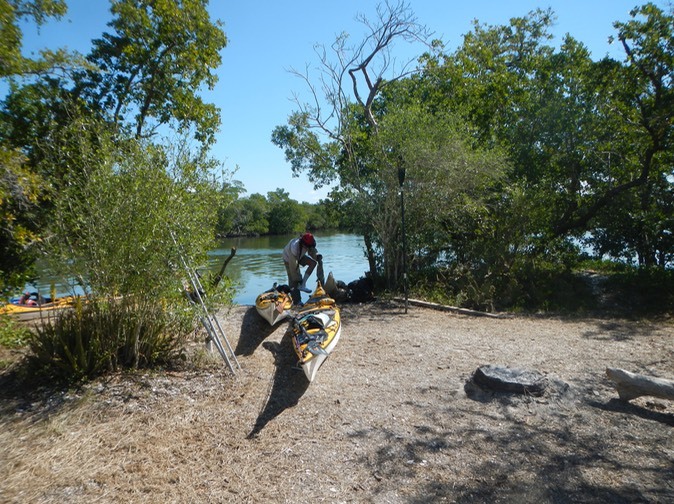 We arrived at the National Park boat ramp sometime after 2:30 pm having covered about nine miles of easy paddling. We tossed our stuff in our cars and headed off, Mark to the state park, Bruce, Alan and I to the Glades Haven Cabin Rentals across from the park. The three of us remaining in Everglades City had one more outdoor dinner at the Camillia Street Grill before turning in. It was a great way to wrap up a wonderful trip. Moving Time: 3 hr. 01 min.